Last week, just in time for a massive can-o-thon over the weekend, I followed a Facebook recommendation to some fantastic, customizable canning jar labels on Etsy. I’d link to them, but my aging memory and the fast pace of digital life don’t always play nice, so I’ve completely forgotten where I saw them. The neat thing about these labels was they didn’t require any special stickers – they were simple circles enclosing the name of the preserve and date made. 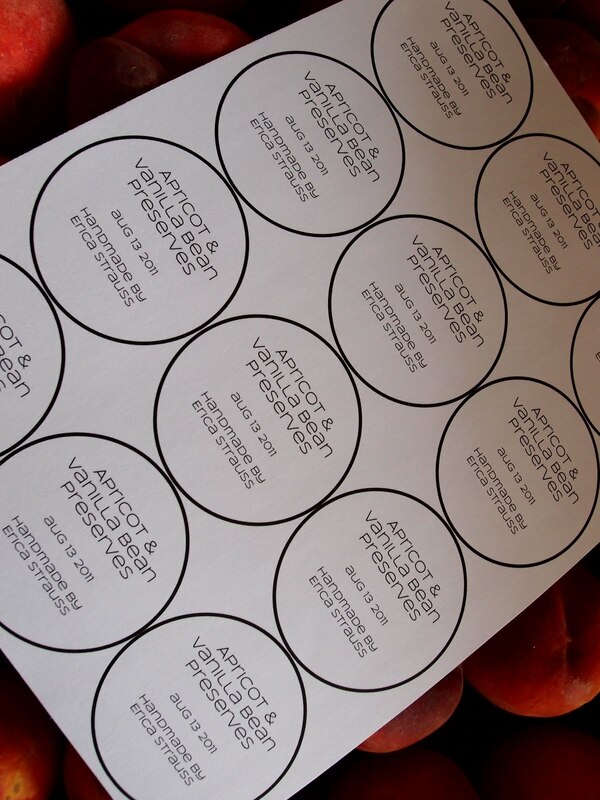 Print out a sheet of customized circles on heavy paper, cut along the line and place the label between the lid and the ring. Tension holds the label on and your jars end up very well-dressed. “Genius!” I thought, “I can make those!” And while my black-and-white minimalist version isn’t as cute as the inspiration piece I saw on Etsy, they still turned out so freakin’ Martha I want to smack myself. I may never go back to illegible sharpie-on-the-lid labeling again. I managed to fit a dozen regular-mouth labels or six wide-mouth labels on one sheet of paper. At first I was cutting them out by hand, which worked great but was a little slow. Then I remembered I had this weird circle-cutter thing from a ill-fated attempt at scrapbooking (as it happens, paper arts are not at all my thing). The pace really picked up with the circle cutter and I became a labeling machine. Want the template so you can customize these labels for your own creations? It’s yours! Check out the Downloadables Tab for Pages and Word versions, and blank PDF circles for hand labeling. Since I’m exporting to Word, there may be some unexpected layout changes. As always, I appreciate it if you can let me know if things look funny. 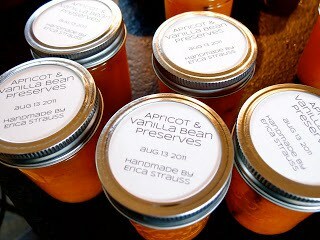 How do you label your jars? I've been using "post-it" file folder labels. They're nice for lots of things because they are easily removable….But this is a great idea and certainly more economical! As mine are stored in big cupboards with adjustable shelves (bimart) it's easy to just label the shelf with a sticky note with a full description . Love this! What a great idea since sticker paper is so expensive, not to mention quirky and temperamental. Thanks for the inspiration! Except you're not supposed to leave the rings on in storage. That way if something goes wrong inside, the lid can pop up and alert you to the problem. As so many folks have said – it's great for gift giving but you shouldn't leave the rings on for long term storage. I use a sharpee. This is an excellent idea for the jars of goodies I give away, as they are the only ones I leave the rings on. Great Job! I too don't leave the rings on but you could do a small adhesive on the back. I actually have a variety of circle punches that work great. You can print the text on the page with or without the circle (I tend to not put the circle) and then just center the text in the circle punch. I use cardstock. Then, to be more like Martha, I use a circle scallop punch on a different colored cardstock as a background. When giving as gifts, you can add cute stamps or punched our objects (like Kacey uses for her cards). I make my own labels and stick them on the jars or bottles by "painting" some milk on the back of the label and pressing it to the container, it works great and lasts for ever, simply wash the container under warm water to remove the label the following year, no sticky mess! Re: leaving rings on in storage; I definitely get that some people prefer to store without rings, because they need to reuse them over the year, etc. And for those who feel it's safer from a food safety/quality standpoint to store without rings, I say – definitely go with your preference. Personally, I haven't yet heard a totally convincing reason why storing jars with their rings on is less safe for the food….I understand people feel that mold, a busted seal, etc. might be more noticeable if food is stored ringless, but since my pantry shelves hold food 3-5 jars deep, the chances of me seeing a problem like that before the food would be used anyway are pretty slim. And since I would obviously discard any jar that showed a busted seal or signs of leakage or mold or a hard stuck ring when I went to use it, I guess I just don't understand how storing ring-on or ring-off actually makes a food safety difference. I am always happy to be enlightened, so if someone has a compelling explanation I am more than happy to be proven ignorant. If you leaves the rings on and the seal is compromised it can allow air in for bacteria to grow. The pressure of the ring can then cause the jar to reseal and you would never know. In the past I have always left my rings on without issue, but after going through the Master Preservers training I am changing my storage method. Thanks Sue – that’s one of two really convincing reasons I’ve heard to store w/o lids. The other is that if anything bubbled up between jar and ring during processing, even if the seal is good a few months of storage can turn jam to glue and make it impossible to get that ring off again! 🙂 I think I will be modifying my ring-storage method philosophy too. Wait, how can the ring be loose enough to let air in, but then also tight enough to reseal? If bacteria did get in then you’d have a mold situation which would be totally obvious to whoever opened the jar. Most people don’t go around loosening and tightening these rings. Usually they go into storage the same way they came out of the canner. With all that being said, I don’t leave the rings on either, but that’s just because mom did it that way. When you give a jar as a gift, maybe with a circle of “kuntry” fabric you’d put the ring back on anyway, no?, to hold the fabric on? BTW, Ball/Jarden sells rinse off labels… no icky sticky mess. Look on amazon. I wish everyone used those, especially Snapple! Love those Snapple bottles. My mom always stored her jars with the rings on. We all lived to tell. FrenchTornado – wow, milk glue. Awesome idea. Tweeted this! I have a lot of people who would love it like I do. After you download the font file, move it into your font folder and you should be good to go. Other than the font, did the rest of the formatting work? Thanks! I tumbled cross this today-thanks for a great idea. I am starting canning this year and this will be very helpful. On a side note, you should try DIGITAL Scrapbooking! Just came across this and THANK YOU SO MUCH! I’m not sure if you’d still respond to comments on this post since it was originally posted so long ago, but if you do…. where did you get the circle cutter? (or do you know the brand/name of it?). Along with traditional canning, I make dehydrated fruit/veggie treats for my dogs and store them in Mason jars, so your template is PERFECT! I even added patterned chevron backgrounds. I looked forever for a free printable that WASN’T meant to be a stick on label, so thank you again! Heather, the circle cutter in the photo is made by Fiskar. Try the scrapbooking section of your loval craft store (Hobby Lobby, Michaels, Jo-Ann’s). I have one but I’ve had it for years. Martha Steward also makes a circle cutter that is even better – you can size your circles from vey small to pretty large (don’t recall the exact measurements offhand). I love that circle cutter even better.